The current front-runner for the next Fed Chair is Kevin Warsh. He seems to have all the prerequisites that Trump idolizes. He’s connected. He’s not an academic. He has conservative leanings. But most important, he’s rich. I mean really rich. You see, Kevin married the granddaughter of the founder of the Estee Lauder company. 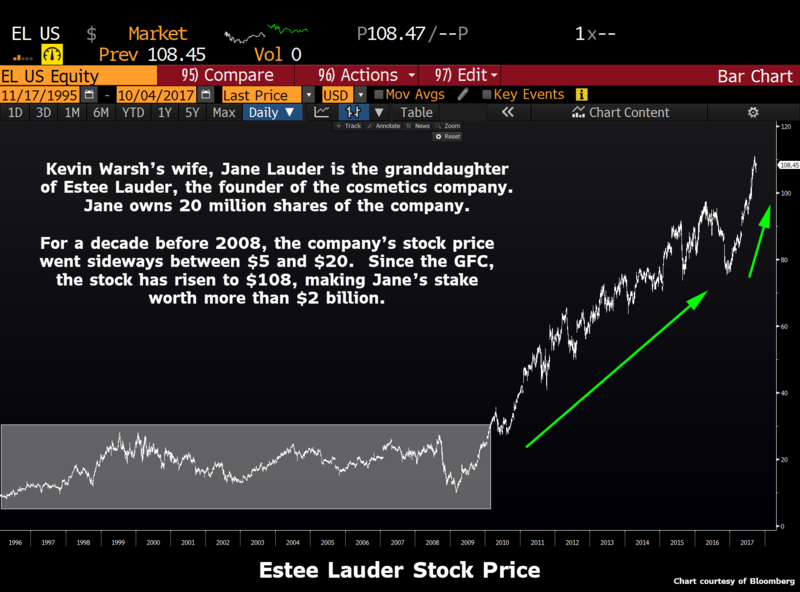 Jane Lauder owns 20 million shares of the company. Just for shits and giggles, I dialed the stock price of the company. At the current stock price, that means the Warsh family is worth more than $2 billion! On the trading desk, we used to joke about having f’ off money (the amount where you can tell your bosses to go fly a kite with no worries about being fired because after all, you already have more than enough.) Well, Warsh is in a whole other league. The prevalent thinking on Wall Street is that although Warsh has in the past been extremely hawkish, if he were to get the appointment, he would quickly shift towards the dove camp. Although I have no doubt he would try to bring the committee together, this is not a man that will deviate from his principles. He believes the Fed has made a huge mistake over the past nine years, and is not wavering in his assessment. Kevin Warsh, the favorite to be the next chairman of the U.S. Federal Reserve, apparently believes the central bank has become a servant to the stock market after years of loose monetary policy. Uber-bear Albert Edwards, an economist at Societe Generale’s strategy team, said Monday that after listening to Warsh speak at a banking conference last week, he would be his choice to lead the Fed. 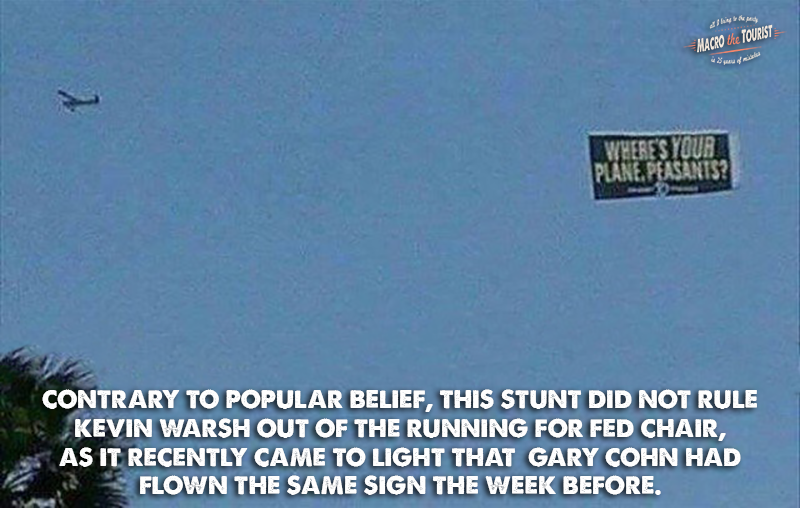 He also revealed Warsh felt the Fed had been captured by the “secular stagnation” ideas of former U.S. Treasury Secretary Larry Summers and had become persuaded by the idea that more monetary stimulus is needed. “Rather than admitting they are wrong, this group, who failed to predict the current economic malaise, have constructed this theory to explain why ever more stimulus is required. In particular Warsh warned that the Fed had become the slave of the S&P,” Edwards noted. “He (Warsh) got a rousing reception from the BCA (Research) audience as he talked a lot of sense - in particular on how the Yellen Fed has lost its way and current policy is deeply flawed,” he added. A couple of questions. How hawkish do you have to be to get Albert Edwards to cheer your nomination? And does this sound like a person about to slip back into the dove camp to gain the President’s approval? Trump campaigned on the idea that the Federal Reserve had been irresponsible and needed a change in direction, but once in office, he started cooing words about how much he likes low interest rates. I think Wall Street wants Warsh, and Trump’s advisors are whispering soothing words in his ear, but that if Trump takes the time to understand the situation, Warsh is the exact opposite of what he desires. I am in the minority amongst my peers because I believe Warsh would be a disaster for the US economy. Kevin is the classic economist stuck believing that nothing changed after the Great Financial Crisis, and all that is required is a return to the good ole’ days of the 1980’s. This camp dismisses Richard Koo’s work about balance sheet recessions, and instead think they can cut fiscal budgets and tighten monetary policy to prosperity. There is no sense arguing about who is right. I try my best to focus on what is instead of what should be. Here is the important part. If Warsh is appointed, he will follow through with his hawkish policies. Ignore all this talk about him shifting to the dovish side. He will only do that once we get a market dislocation. Sure, I buy the argument that there are no atheists in foxholes, but the shells needs to start flying overhead first. I see that Doubline’s Jeff Gundlach has joined me in my call (The Trump Eclipse Bottom) that Trump will appoint Neel Kashkari. I still think that if Trump listens to his inner voices, he would pick an easy money guy. Neel makes a lot of sense. He is a Republican, he has experience, he is a dove. On paper, he is everything Trump is looking for. But his name does not seem to be bandied about. Not sure why. Here is my new prediction. If it isn’t Kashkari, it’s going to be Cohn. Gary didn’t get as high up at the squid without learning something about politics. Yeah, he messed up by not standing behind Trump in those ugly moments, but it wouldn’t surprise me if he has since kissed and made up. So I am taking Cohn for $200 Alex. Cohn will be the most difficult appointment to trade. Warsh hawk, Kashkari dove, Cohn? Proving a blind squirrel finds an acorn every now and then, I managed to get my long US dollar call from the other day right (The Fall Guy). Longer term, I am a US dollar bear, so it was difficult for me to pull the trigger on the long side. 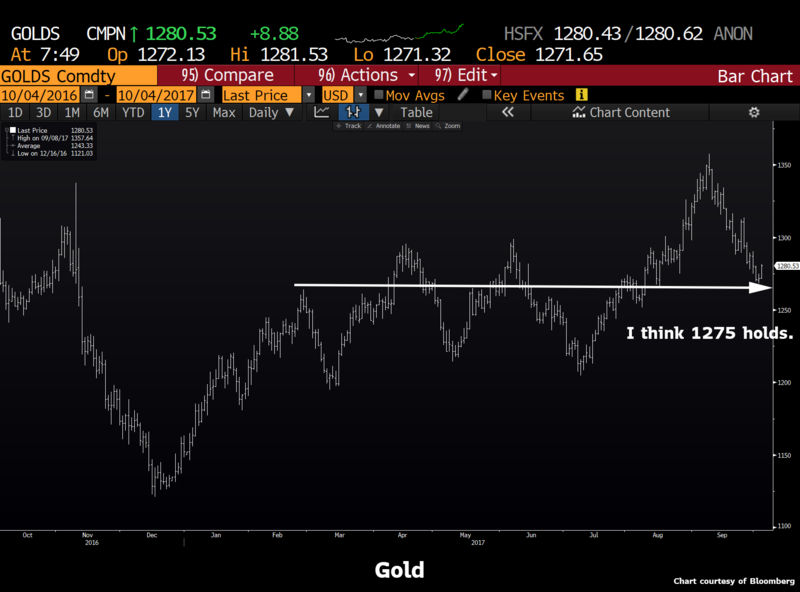 Since then the US dollar has rallied, but even more importantly, precious metals have stunk up the joint. I feel a little naked with long US dollar exposure, and little precious metals. So I am taking off some of my long USD position, and adding to my gold and silver.